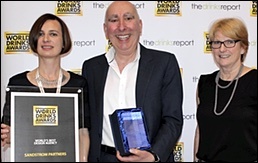 The awards were presented by the World Drinks Awards chair and editor of TheDrinksReport.com, Felicity Murray and were selected by an international panel of experts over three rounds of judging. Felicity says: "The judges of both the Taste and Design categories were extremely discerning ­- all those who have won an award can be justifiably proud." This superior quality Armagnac is very well balanced with ripe fruits, brown sugar and dry wood cedar notes. On the palate, it is quite round and fruity, with plenty of complexity and a hint of spice. This rich and tasty Spanish brandy has a wonderfully sweet raisin/grape molasses nose with added spice to the typical barrel influenced palate. Vanilla and caramel and a lot of oak dominate on the finish along with raisin. This XO Cognac has raspberry, coffee and tobacco on the nose and a full-flavoured palate of cranberry, ripe pineapple and rum raisin. The finish is long, sweet and easy-going with caramel flavours mixed with strawberry liquorice. This traditional style gin is fresh, vivid and focussed with a very nice, classic juniper/citrus nose. Its flavours are intense, clean, herbal and well integrated. A pleasant aroma on the mid palate carries through to a very long finish. Simple but classy. This easy drinking Grappa has the evidence of wood aging with cereals, sweet vanilla and caramel, along with some light red fruit notes of strawberry and cherry. It is an elegant, creamy/vanilla style, with baked apple/sultana, and notes of cherry, burnt sugar and hazelnut/chocolate cream, and just a touch of grape flavour on its long sweet finish. This chocolate liqueur has a very good balance of chocolate characteristics along with desiccated coconut and toffee on both the nose and palate – it's easy drinking and absolutely delicious! This pre-mixed cocktail is perfectly balanced with beautiful rich flavours. There are notes of ash, raisin, plum and rich sweet vermouth. This is a whisky cocktail with a subtle and elegant nose, warming alcohol with a honey palate and nice length. Named ‘Nelson’s Blood’, this rum has an exceedingly herbal nose with notes of camphor and eucalyptus. Hints of molasses, walnuts, and cane sugar follow with a lightly aged rancio. The palate opens with sticky toffee, sugar cane syrup, molasses and a touch of burnt toffee. Again, a slightly aged rancio of dried prune, date and walnut with the camphor and eucalyptus a lot subtler than they were on the nose! Tropical fruit, liquorice and oak also come through. It’s very well balanced, has good flavour and a good length with a soft spice note and just enough alcohol to balance the sweetness. This aged tequila has a good colour, body and great character. It has a smoky and complex nose with herbaceous notes and a nice long finish. This clear bright vodka has a lightly oiled nose with plenty of barley and whisky-like notes. With time, a touch of smoke emerges along with a hint of violet. It is Soft and lightly creamy on the palate with a touch of barley and smoke. Smooth and invigorating, it has a juicy, slightly peppery finish with a touch of grapefruit citrus. The beautiful bell shaped bottle reflects the care and attention that has been gon into designing this understated yet luxury product. The metal label has some extraordinary detail and provides a confident attitude, being the only adornment to the bottle. A subtle and defined design with a crisp and well managed execution. Every detail tells the story of the brand subtly and beautifully from the beautiful machine finished closure to the uniquely crafted bottle and typeface. The design is a perfect example of less is more. Blue, gold and beautiful, this innovative design by Love is a grand departure from traditional whisky that will hopefully draw a younger audience. With its groundbreaking shape and stand out colour it's positioned itself well in what was becoming a tired category. It "shall do for whisky what Absolut has done for vodka". World’s Best Design Agency, sponsored by Guala Closures Group, Sandstrom Partners designers of Aviation American Gin. 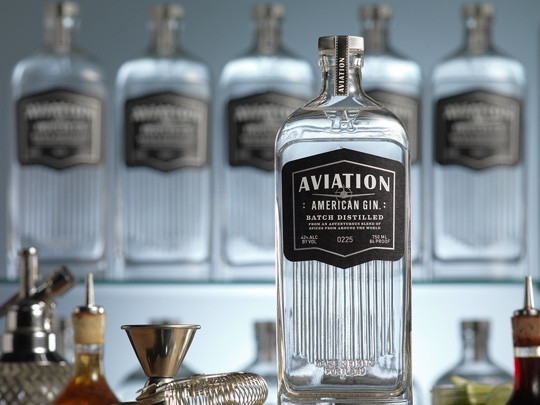 Sandstrom Partners explained how the bottle and graphics for House Spirit's flagship brand, Aviation American Gin, were created to evoke the jazz age when the Aviation cocktail was first mixed in New York but with a modern look to appeal to today's sophisticated cocktail drinker.